The recorded history of Dor under Roman rule starts in 63 B.C.E. when it is mentioned in a list of towns granted autonomy by Pompeius (Josephus, Antiquities XIV 4:4). Though the town must have been inhabited continuously, geographical treatises of the mid-first century C.E. refer to it as abandoned (e.g., Pliny, Historia Naturalis V:17) or neglect to mention it at all. Dor is mentioned in connection with an incident of religious repression of the gentile population against the local Jewish minority in 41 C.E. (Josephus, Antiquities XIX 6:3). From this source it may be inferred that Dor was part of the province of Syria, rather than of Judea. During the great Jewish revolt of 66 - 70 C.E. the Romans kept Jewish hostages at Dor, which they must have regarded as a safe haven from the rebels (Josephus, Life VIII). It is noted both by Pausanias and Claudios Ptolemaios in the second century C.E. as one of the ports of Phoenicia. A dedicatory inscription to a Roman governor of Syria dated 119-132 C.E. corroborates that the town was part of that province. Dor is never mentioned in any historical document again as a city and both Eusebius (273 - 340 C.E.) and St. Jerome (390 C.E.) refer to it as ruined. The coins provide a complementary source for the fortunes of the town at that time - both those found at the site and coins minted at Dor and found elsewhere. This evidence reveals two periods of great economic activity - a short one just following the re-establishment of the town by Pompeius (63 to c. 33 B.C.E. ), and a much more vigorous and sustained one from 64 C.E. to the Severan period. The last known coins to be minted at Dor are dated to 211/212 C.E. As for coins found at Dor - though they span the entire Roman period, they are especially numerous from c. 60 C.E. to about 235. Coins from after the mid-third century are rare, and are almost invariably surface finds. From all of the above it can be deduced that the decline of urban occupation on the tell should be placed at about 230 C.E. Compared to other cities in the Levant in this period, Dor was a small provincial town. In particular, it is overshadowed by its nearest neighbor, Caesarea. Indeed, the building of an artificial deep water harbor there by Herod the Great starting 37 B.C.E. may have played a role in Dor’s modest size and eventual decline. Although Caesarea was in another province (Judea, later renamed Provincia Palaestina) there was little economic justification for two major harbors just 15 KM (10 miles) apart. 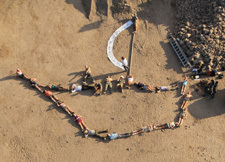 The superior port facilities in Caesarea won out. Even so, Dor prospered for much of the period. It is under Roman imperial rule that the town reached its greatest extent. The Hellenistic walls around the tell were disused early in the period, and the town spread to the plain below, reaching a size of some 15 hectares (vs. nearly 100 hectares of Caesarea at its widest extent). It had every amenity Roman citizens were accustomed to, including mosaics and frescos in some of its wealthy homes, paved streets, public squares, running water brought by an aqueduct from Bir Tata in the Carmel hills, a central sewage system, at least one bath-house, a theatre, and impressive temples to the city gods. Local phase 1: meager remains - section of Persian- Roman street I leading from area B to area C.
Local phases 1-2 (strata I-II): Most of the material excavated in Area B2 belongs to the Roman period Large tracts of the entrance to the [upper] city and regions to the west and south of it were uncovered. In this period, the mound was unfortified. As the city had grown by then to incorporate a lower town beyond the tell, such a fortification would have been superfluous. Over the old Hellenistic wall and gate a wide, open plaza was built. 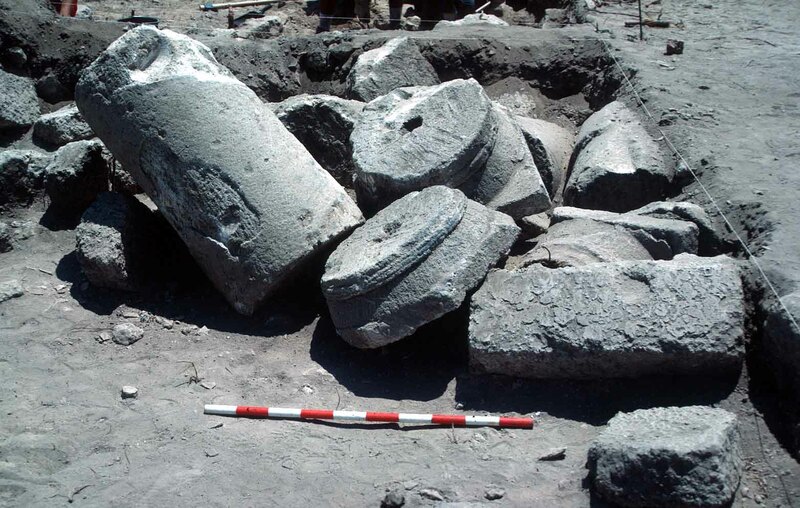 Several column drums found on the pavement may indicate a colonnade around this plaza - much like the entrance to contemporary Gerasa in Jordan. Two of the main streets of the city intersect in this plaza. 'Street I' leads from the plaza northwards, and was followed through areas B1, A and C. On the opposite (south) end of the plaza, the same street continues toward the southern harbor. At the west end of the piazza starts the main E-W street, perhaps the decumanus maximus of the city. The same street was traced through to area G, in the center of the mound, where it intersected by the main N-S street - the cardo maximus, and then probably continued all the way to the main gate of the temple in area F.
South of the entrance plaza, and east of street I, was found a large house with peristyle courtyard. Wheelmarks in the wide entryway to this structure indicate that carts or chariots were driven from the street into the peristyle and vice versa. Thus this structure may have been used as an inn or perhaps as barracks. Opposite it, on the west side of the street, are foundations of a very similar structure. To this latter structure was added, in phase 1, another peristyle (or perhaps a basilica-type hall) with an opus-sectile floor. Finally, at the intersection of street I with the decumanus, is a long stoa-like structure. Also remarkable for this area are the various Roman water-systems. Just south of the city-gate and plaza was the terminus of an aqueduct, which fresh water from springs at Bir Tata, some 12 km. to the east, in the Wadi Milh pass in the Carmel mountain range. At the terminus is a solid concrete foundation, possibly for a 'Castelum' (water-tower) - from which water was distributed throughout the city in clay pipes. Also found underneath the decumanus was the central sewer draining out of the city. 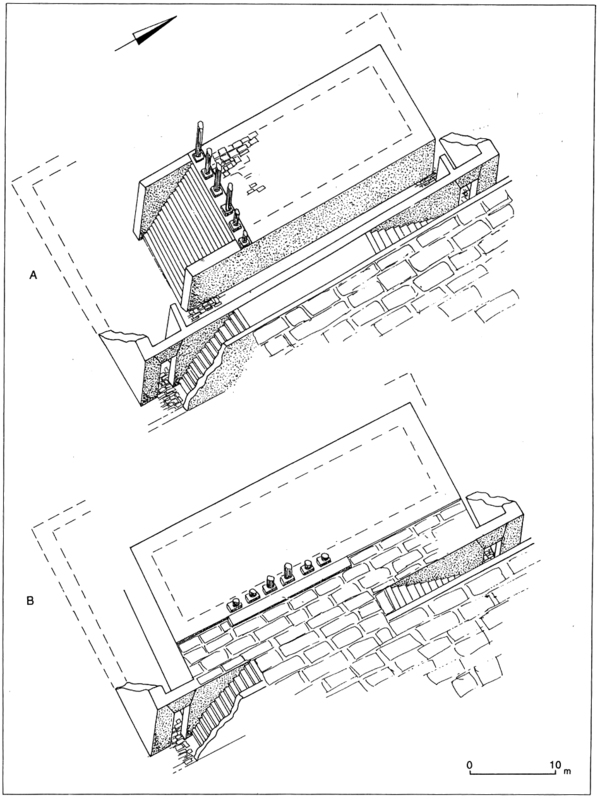 Local phases C0/2, C1/1, C2/2a-c: These mark the final use of the three residential insulae. The two streets - street I, between C0 and C1 (traced through areas A B and C) and street II, between insulae C0 and C2 - were paved and connected to a central drainage system. A section of the lower city at the foot of the mound also dates to this period but remains largely unknown. Local phase 1-2: In the Roman period, Area D on the southern slope of the tell consisted primarily of residential insulae and industrial facilities, though not much remained beyond foundations. The residential areas best represented in area D2. Two phases of house remains, comprising parts of three insulae, criss-crossed by two streets - the southernmost E-W street (which continues to the west through D1),, and the main N-S street, which bisects the town, leading from the southern harbor to area G.
One insula (the southwestern one) seems to be occupied by elegant residences, some with mosaic floors. In the northeast insula (the main excavation area), a residential structure seems to be replaced by a larger, more public one. The third insula (the southeastern one) has industrial installations of indeterminate use. In the northern part of the area - areas D6, D4, and part of D1 - were found buildings containing small plastered pools, ovens, and a complex drainage system, suggesting that this area was given over to industrial activities. Analyses of one oven in area D6, using Fourier Transform Infrared and X-ray fluorescence spectrometry, suggest that it was used specifically for casting lead-bronze objects. Many decorative architectural elements (doric capitals, stucco molding) from earlier buildings were found reused in the foundations of walls of this area, especially areas D1, D4, and D6. 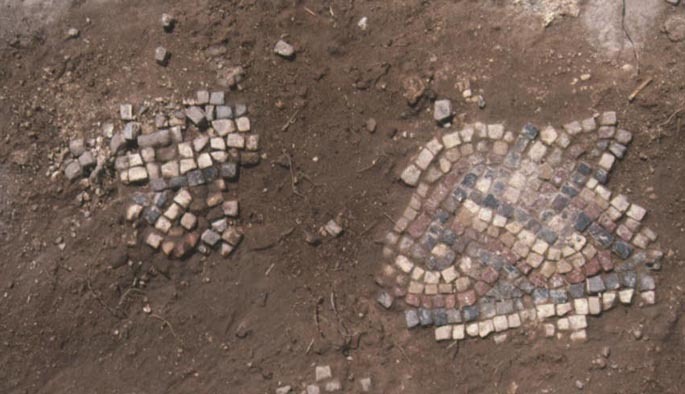 Several dumps of architectural material were found in and below the foundations, which contained debris from earlier (Hellenistic-era) structures, including fragments of the fine opus vermiculatum mosaic depicting a garland and mask. Located on the western slope of the tell, north of area F, near the boatslips. The main find in this area is a Roman bathhouse, but it is poorly understood thanks to the erosion of the tell. Local phases 1-2: We have two distinct phases of building activity in the Roman period in area F. The earlier one (phase 2) consists of a long street running N-S with residential insulae on either side, which continues south into Area H. This residential neighborhood is replaced in phase 1 with the monumental construction of a temple precinct and its approaches, which envelops the western slope of the tell and beach. This temple precinct was first investigated by Garstang in the 1920s, who believed it dated to Hellenistic times. However, recent excavations have determined that it dates no earlier than the mid 2nd-century C.E. While molded architectural fragments found in the precinct and around it permit the reconstruction of the order (Ionic) and size of the structure, the only in situ walls belong to the sub-structure of the building. Thus any reconstruction of it would be conjectural. Garstang's conception of it, however, as a south-facing prostyle temple on a high podium, cannot be reconciled with present evidence. The main structure appears to be a three-sided podium, connected to the tell on its eastern (long) side, but towering over the rocky beach on the north, south and west. A perambulatory passage around this podium, on a lower level, could be reached via a system of staircases and retaining walls on the south and north edges. 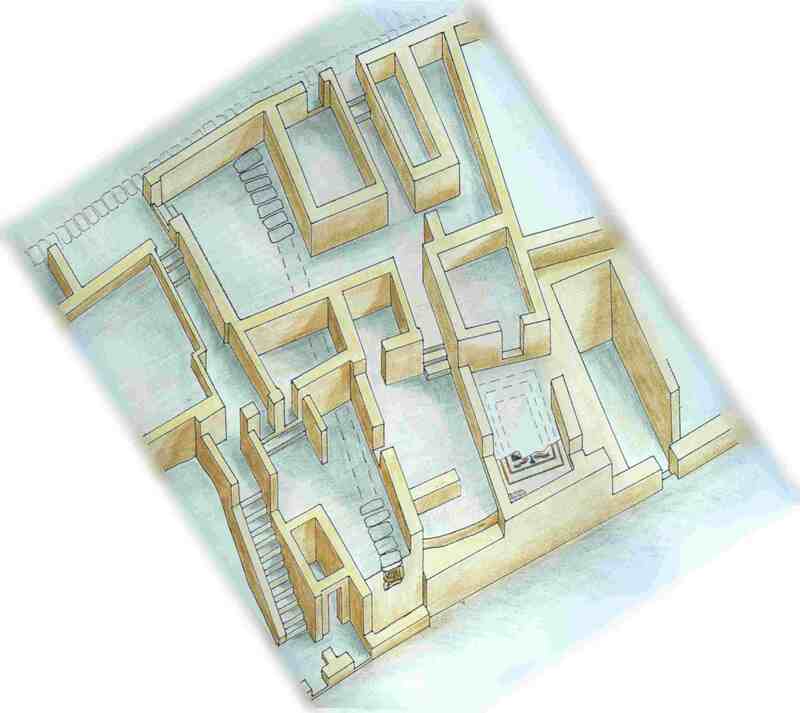 A possible reconstruction is as a Levantine-style open-air sanctuary (bamah), perhaps surrounded by stoas on three sides. Local phases 1-2: Immediately below the surface, excavation hit an extensive stone pavement of a wide open plaza dating to the Roman period, perhaps surrounded by a colonnade, which marks the intersection of the cardo maximus leading from here to area D2 and the decumanus maximus, which was traced from here to area B. Towards the west, it is aligned with the central entrance to the temenos in area F. Nothing has remained of the superstructure of buildings around this plaza, but massive cement foundations indicate large structures (perhaps colonnades) around it. Local phases 1-2: As in other areas, two Roman phases were found. The earlier phase (2) consists of an insula, with shops and apparently well-to-do residences. 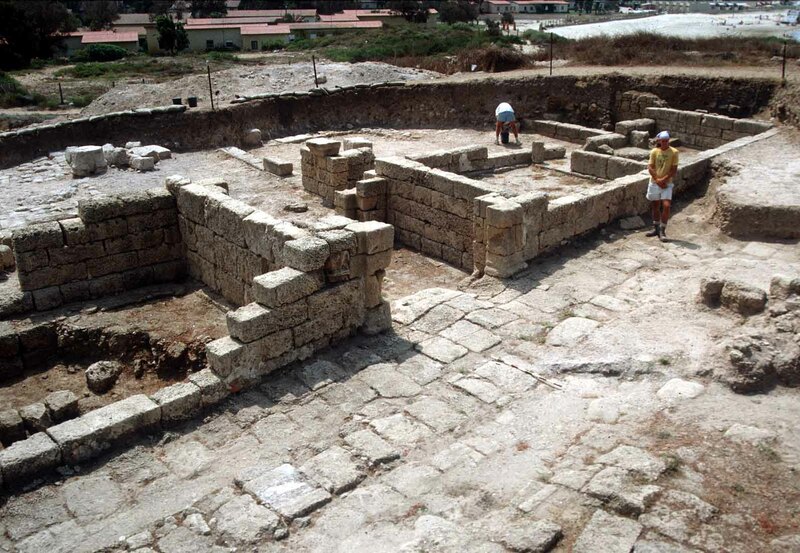 Built on the western slope of the mound, right above the beach, and completely buried by the massive filling operations of the phase 1 temple podium (see below), their preservation is extraordinary - the western half of the building stands two stories high – including the basement level and portions of the ground floor. In the basement of one of the unit thousands of wall fresco fragments were found, some of which featured floral and faunal motifs. Portions of a floor mosaic depicting two dolphins flanking a trident were found in situ in another chamber. Similar to Area F, these houses were completely buried under the foundations of a large temple and its entry ramp. None of the superstructure for this temple remains. What does remain consists of constructional fills and a series of foundations/retaining walls.